The Linden Road and Pine Road sites presents an opportunity to provide much-needed homes set within a previously under-utilised site. Our designs seek to utilise the potential of the site by improving its integration and surveillance, and by providing improved amenity space for residents. The immediate surrounding context is residential, predominantly consisting of large suburban semi-detached and short terraces of houses. It was therefore felt appropriate to develop the site with a mixture of single houses and a single flat block with massing in keeping with the semi-detached properties opposite. 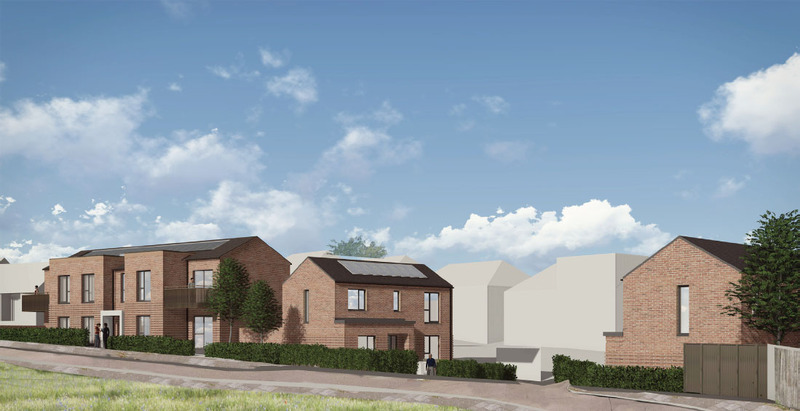 Two wide-fronted houses and 4 flats for affordable rent are proposed, forming one two storey block of flats and two detached cottages at the Linden Road entry. They create a clear and active frontage overlooking the surrounding roads, helping to supplement the passive surveillance of the area and fitting well within its urban realm. Each house is 84 sqm GIA and compliant with London Housing Design Guide SPG. The proposed two 1 bed 1 person flats and two 2 bed 3 person flats are also in line with London Housing Design Guide SPG 2016 standards and they are 41sqm and 62.4sqm. Cycle storage for each house and for flat blocks are provided in rear gardens via secure side access gates. All homes are for affordable rent. All homes are dual aspect and generously sized in accordance with the London Plan Housing SPG 2016. Each house has a private rear garden ranging in size between 48-75 sqm in accordance with LB Barnet Policy. There is a communal garden at the rear of the block of flats. All homes have planting to form defensible space to the front and houses have a bay window at ground floor. The houses are designed to be low in height so as to allow good sunlight / daylight penetration into the rear gardens.